The UK’s aerospace trade organization ADS Group has cautioned that despite the global aerospace industry remaining on track for 2018 to be a record year, a no-Brexit exit by the UK next March could create immense disruption. According to figures gathered by ADS, this year’s commercial aircraft deliveries reached 809 at the end of July, exceeding last year’s total by 37, according to data collected by ADS. Figures cover reported deliveries of commercial aircraft by Airbus, Boeing, and Bombardier. July proved a record month, as the OEMs delivered nine more aircraft than the 107 they shipped during the same period in 2017. 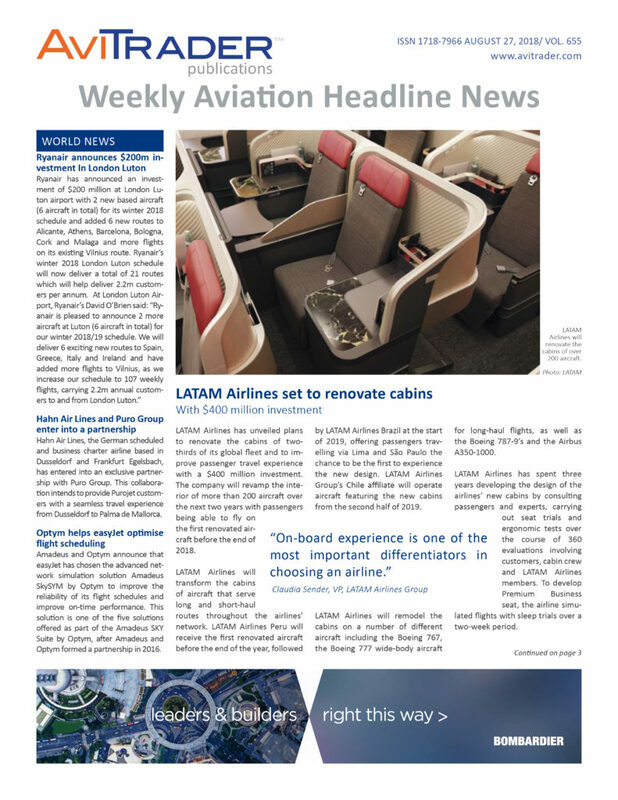 The industry’s order book backlog remained above 14,000 aircraft for the eighth month in a row. The 116 Airbus, Boeing, and Bombardier aircraft delivered in July are worth up to US$2.58 billion to the UK’s aerospace industry. One of the most pressing problems facing the British aerospace industry is that while the UK government last week published its first set of technical notices explaining how British businesses and citizens should prepare for a possible no-deal Brexit next March, none of the first 25 or so notices included aviation. Embraer Services & Support and LOT Polish Airlines, the national carrier of Poland, have signed an extension of the pool agreement to support LOT’s fleet of 34 Embraer E-Jets. In a multi-year deal, Embraer’s popular component support solution includes exclusive on site stock for LOT as well as extended scope of engine line-replaceable units (LRUs) for E190/E195s. The program will support LOT’s current fleet of 18 Embraer E170/E175s and up to 16 Embraer E190/E195s – it includes additional six Embraer E195s that LOT leased in 2018 from Nordic Aviation Capital (NAC A/S) already in operation and four new Embraer E190 that the airline will be operating from January 2019. Thomas Global’s TFD-7000 Series flight displays have been selected by a major North American operator for installation in its fleets of Boeing 757 and 767 aircraft. The new displays leverage Thomas Global’s pioneering Adaptive Display Architecture™ CRT-to-LCD technology and follow the company's introduction of the technology across a range of other commercial aircraft types. Installation will begin in early 2019. The TFD-7000 Series displays are plug-and-play active matrix LCD replacements for legacy Rockwell Collins EDU-776C/D and EDU-766C/D cathode ray tube (CRT) displays installed in Boeing 757, 767 and 737 Classic flight decks. The new displays feature advanced growth capabilities to support a range of future functionality. Developed with input from leading operators, the TFD-7000 Series displays significantly reduce maintenance costs compared to keeping the legacy CRT displays, and eliminate the obsolescence threat and last-time buy commitments associated with CRT technology. In addition, the TFD-7000 Series helps operators to avoid more extensive and expensive full flight deck retrofits – while sustaining aircraft operations and meeting operational requirements. The new displays offer quick plug-and-play conversion, are fully interchangeable and intermixable with existing CRT displays and require no changes to flight deck wiring or panels and no crew retraining. 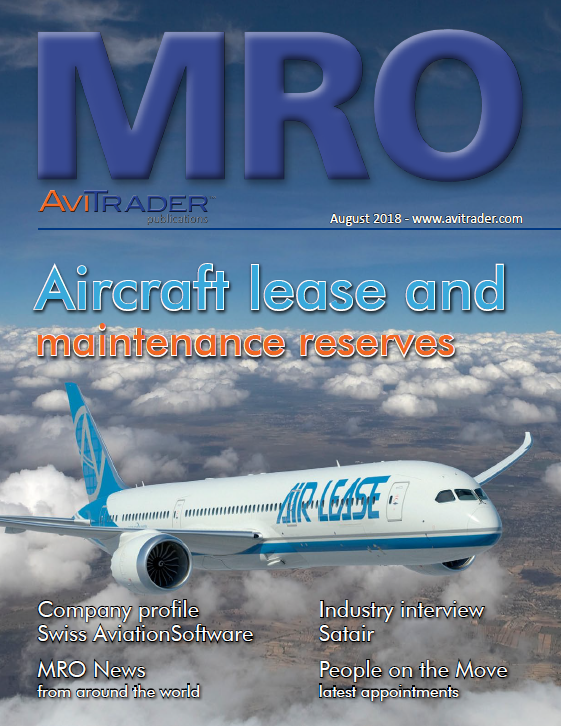 Vallair, the aircraft trading, leasing and specialist MRO organisation, has added a further A321 aircraft (MSN1017) to its portfolio under lease. The aircraft was purchased from Plane Business and it forms part of Vallair’s recent purchase of six A320 family aircraft, all of which will be attributed to short term lease agreements. These aircraft will ultimately serve as ongoing feedstock for the Company’s launch of the Airbus A321-200 P2F cargo conversion programme. A full maintenance ‘C’ check will be carried out in Thailand prior to arrival at Vallair’s MRO facility in Montpellier, France, before hand-over to the new lessee airline. Danish Air Transport (DAT) has acquired 60% of Nordic Regional Airlines AB (Norra) from Finnair, which held the 100% stake in Norra on an interim basis after Norra’s previous owners who held 60% of shares exited the business in November 2017. Finnair continues to own 40% of the company. As such, the transaction has no impact on Norra’s operations, personnel or purchase agreement between Finnair and Norra. Norra operates Finnair’s domestic and European routes with a total of 24 ATR and Embraer aircraft. “Finnair’s and Norra’s partnership model in domestic and regional purchase traffic has served us well, and the Danish Air Transport will strengthen the partnership even more. They have solid experience in operating regional traffic with an ATR-fleet”, says Jaakko Schildt, Finnair’s Chief Operating Officer. “We know there are great opportunities in a strategic partnership. We can strengthen our technical and operational knowledge. The companies have the same size and both flies with ATR aircraft, which gives operating and purchasing advantages. With our knowledge on scheduled and charter flights, together with Norra's knowhow, we can develop the business together. And with new options on the Embraer 190 aircraft, that fits into our niche charter production," says Jesper Rungholm, Director in DAT. Ethiopian Airlines, the largest Aviation Group in Africa has finalized an agreement with the Government of Chad for the launch of Chad national carrier. Ethiopian has a 49% stake in the joint venture while the Government of Chad retains 51%.